Since I’ve begun sharing my EduDigis, I’ve had lots of questions about how to use them. So I decided to create a digi stamp tutorial that covers simple placement and manipulation of images, as well as layering pngs and more. If you’ve never used digital stamps with your printer, please download the freebie below and test it to be sure your printer is Copic-friendly. If the toner bleeds with Copic marker, you can take sheets of Neenah to a copy shop and have them copy it for you. Some printers may require documentation that you have permission to photocopy. If you don’t want to mess with all of this and you’re just after the educational part – there’s a practice sheet at the end of each PDF…the images are card-sized, so you could just use those and trim them out. If you want to do no-line coloring, it’s possible that your printer has options to print at a lighter percentage, but the steps here will give you great control over exactly how dark or light it will be. If you’d like to watch a video digi stamp tutorial by my friend Zoe on compiling complex images into a scene, she has an extensive one HERE. 1. First, grab one of my digis. Below is a freebie for practicing – if you purchase an EduDigi bundle, you’ll download it and unzip it when you get the link in your email receipt. If you’re on a tablet, please know that you need to have files on a computer- you can’t really use them from your tablet. At least not as far as I know! If you download it and unzip it into a Dropbox though, you may be able to view my educational PDFs on your tablet. 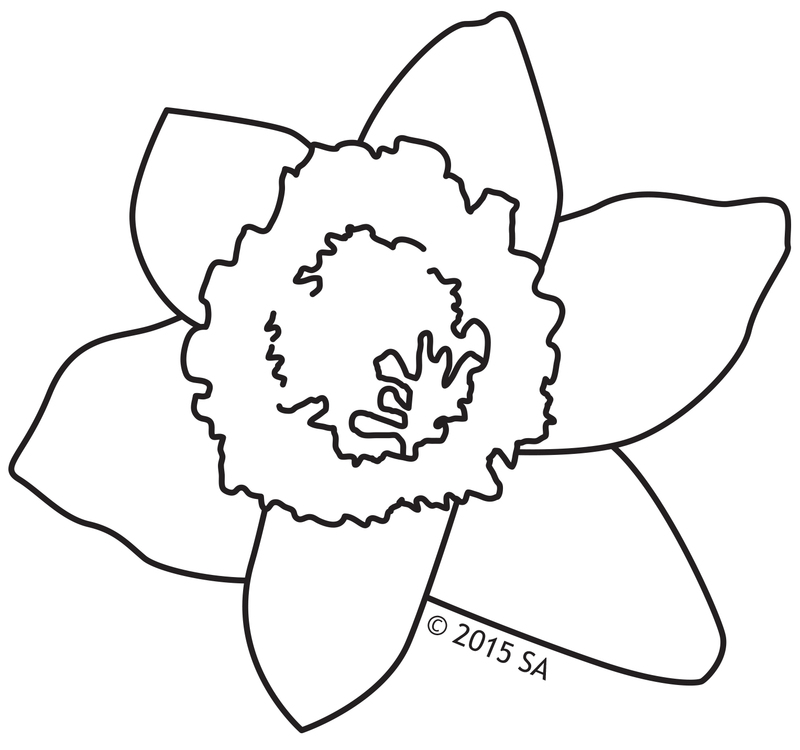 Click on the image, then right-click to download the JPG and PNG versions of this daffodil. 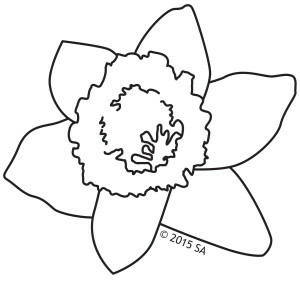 The PNG version has the outside “transparent” – in the thumbnail below, you may see “grey”around the daffodil. The JPG version can’t be used in layering since the outside edges are white. So we’ll be using the PNG version in the multi-image composition exercise below, so you can see how you can layer images to compose a scene. If you aren’t doing scenes, JPGs are perfectly adequate. 2. 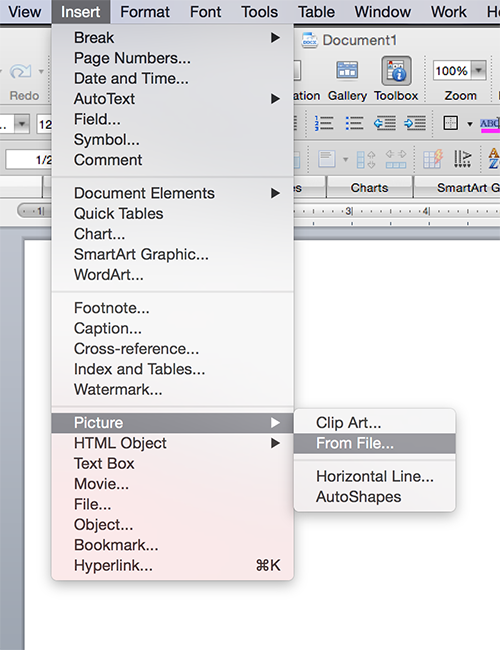 Create a new blank document in Word, horizontal or vertical. Go to the INSERT menu, then scroll down to PICTURE, then FROM FILE, and go find the image you just unzipped. If you want the outside to be transparent, pick the PNG file. 3. Size the image. It will appear at full size in the window. To resize it, drag the corner points (NOT the sides). Dragging the sides will stretch your image tall or squat. Or – just double-click on the picture. Click on SIZE in that window, and since “Lock aspect ratio” is checked, if you type 50% into one window, it will automatically resize the other one the same and the image will retain its integrity. You’ll also be able to see the size of the new image so you can determine if it’s what you want. 4. Add more images onto the page, and if you want to be able to move them around to fit more on a page, click LAYOUT and select “In front of text.” That will allow you to move the image around with your mouse wherever you like. 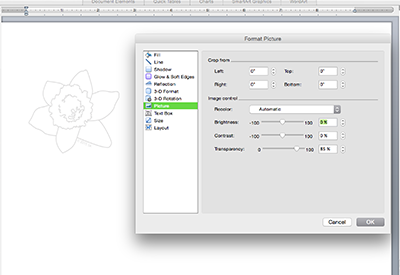 Note that if the images are huge, they’ll automatically roll onto the next page of your document. Make them smaller to fit on the same page. 1. 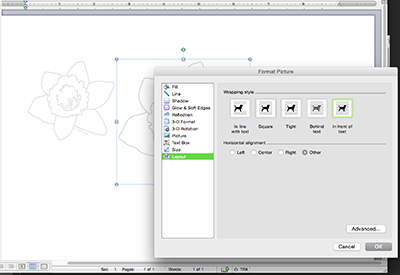 To place several images into ONE scene, be sure you’re using correctly formatted PNGs. If your images will not layer the way shown, contact the company who made it and have them send you a new file. 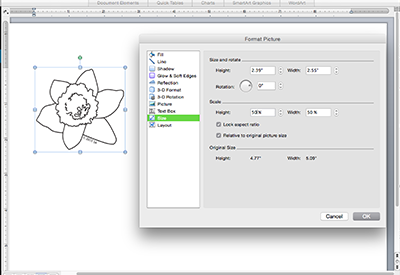 *Note that when I first began my digistamp series, I made my PNGs incorrectly. If you come across one that you’d like to make into a composition, please email me and I’ll get you the revised one. Sorry about that! 2.Follow all of the basic steps above. When you add the image you want to be on TOP of the first, set the LAYOUT to In Front of Text, size as desired, and move it around with your mouse. 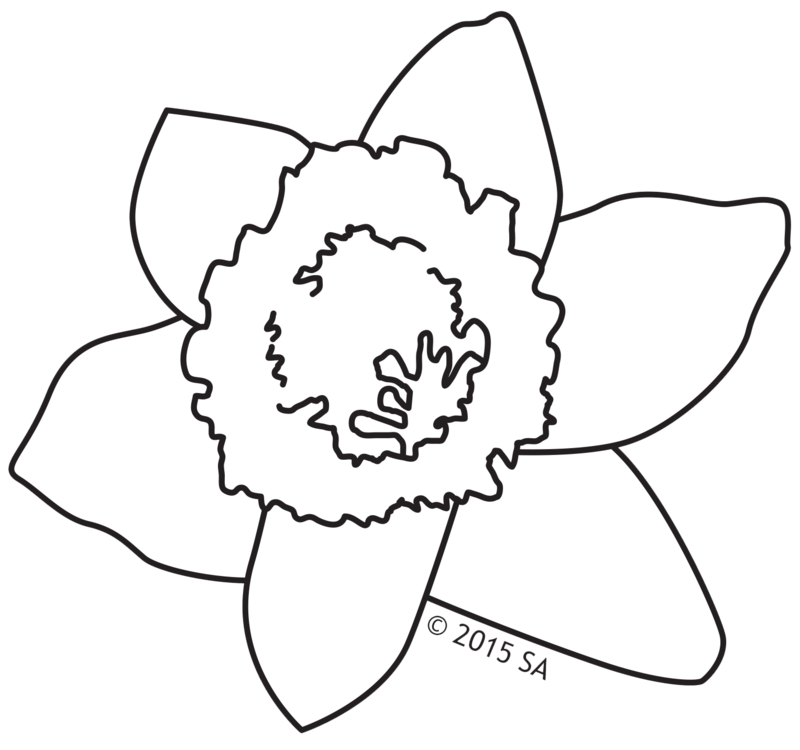 In the example below, the second jpg is larger than the first – and you can see that it covers the flower under it, but not in a square shape. A jpg image will import as a square overtop of the first image. Size and print as desired! If the initial image is small and you blow it up, the lines will get THICKER. Keep them close to the same size if you want them to look like they’re part of one stamp. 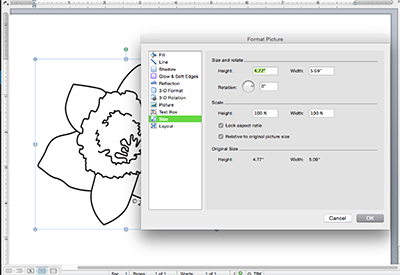 If you’ve right-clicked on a digistamp “thumbnail” file, you may get one that imports very small into Word. That means blowing it up will also make the edges jagged. This often happens with freebie images – so be sure you’re downloading the highest resolution image you can get. 1. Follow all the basic steps above. 2. Change the transparency. Doubleclick and go to PICTURE in that dialog box. Drag the bar labeled TRANSPARENCY to the desired percentage – 85% is what I selected here. You should be able to see the effect on your image as you do this. Then click OK! 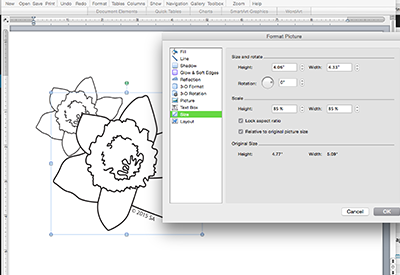 I hope this has been helpful – be sure to leave comments if you have further questions I can clarify for you and I’ll edit this digi stamp tutorial page.